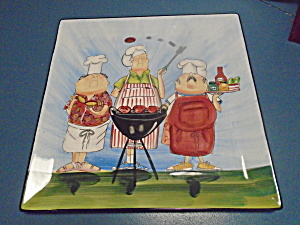 CIC Tracy Flickinger Master of the Grill Waiters Square Platter/Tray . This platter or tray is 15 in. square and ceramic/stoneware. It is in mint condition. I can't find the exact pattern but to me it looks like the waiters on Dinner Is Served took a day off and are having a bar-b-que and enjoying their life! !